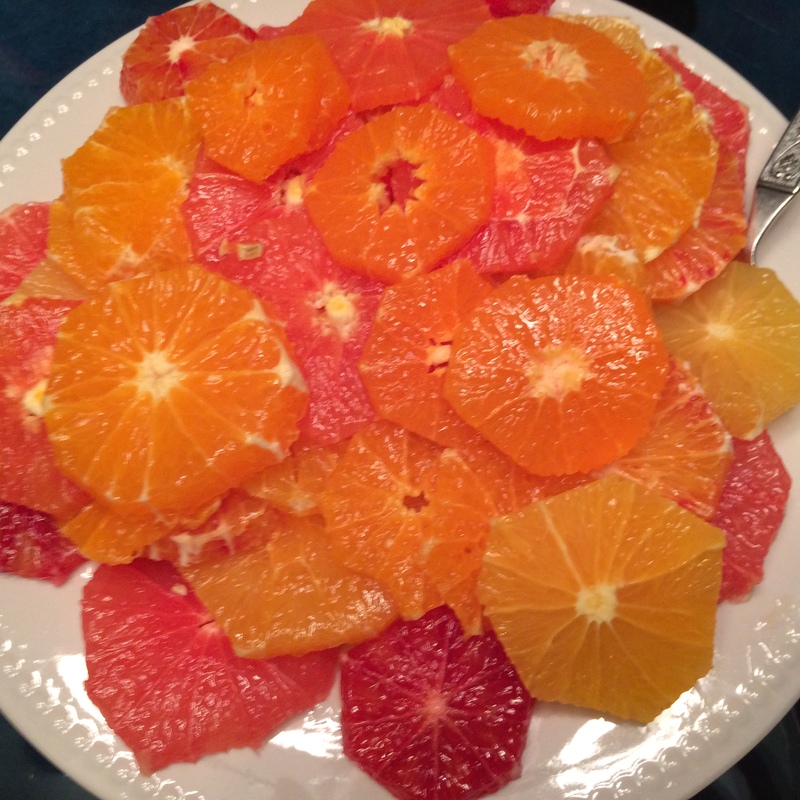 This is my new favorite thing to make—a citrus salad. The citrus salad from last night’s dinner. I got a little carried away with the number of varieties, but it seems like the more varieties, the more interesting it gets. We saw one of these for the first time (Where have I been? or Where have these been?) on the salad bar at Fogo de Chão last month where we took my mom for her birthday. I loved both the taste and the presentation and decided to make my own. It’s interesting visually, tastes phenomenal (bearing in mind that not all varieties of citrus are sweet—I’m thinking it was the Seville that I threw in that added a little bit of pucker factor—lesson learned), and serves well as both a salad and dessert. I love the simplicity of it. You buy one of each of a variety of sweet citrus fruits, slice them thinly on the horizontal so that you can see the cross sections, trim off the peel, then combine the various citrus wheels in a random order. The worst part is apologizing to the young lady at the check stand who has to punch in so many numbers. You try to be charming and talk about how much your wife likes this salad. Only in America would I expect to walk into a grocery store and find so many different varieties of citrus fruits—pink and ruby red grapefruits; blood, heirloom, cara cara, and Seville oranges; tangerine, satsuma, and clementine mandarins; and all manner of hybrids, like the tangelo. What a country. What a creation that has so much variety and yet offers wonderful possibilities for those willing to engage it through husbandry. This is seasonal, so I’m thinking this will be an annual, wintertime treat.